Enjoy the Rainforest from a Slow-Paced Gondola, Hanging Bridges & Trails. The Arenal Volcano Area is one of the most popular tourist destinations in the country due to the natural beauty of the rainforest and the imposing Arenal Volcano and lake. Pick one of four options to visit the Arenal area rainforest and admire the views of the region. The Sky Tram and Walk tour includes a ride in a slow paced gondola over the rainforest and then a walk through the jungle over a series of bridges and trails! 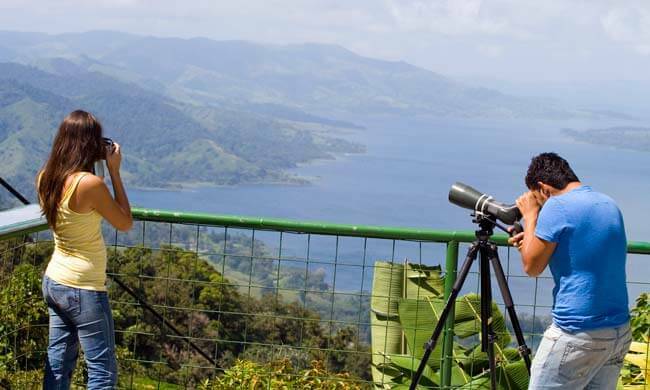 This is a wonderful, unique way of exploring the rainforest from a different perspective with ample opportunity to spot wildlife. This tour is great for all ages! You can also include zip lining and visit to hanging bridges. Board a gondola with your local bilingual guide, and soar through the rainforest taking in the incredible views of the mountainous area. The tram can be stopped at any time to spot wildlife and take photos. At the end of the tram line, you will reach a wide observation platform on the highest point of the Arenal Reserve, where you can sit down on comfortable chairs to enjoy the view of the volcano, lake, mountain range, and rainforest. Walking trails will take you into the rainforest that comprises some of the world’s most complex ecosystems. Your bilingual guide will be a wealth of information pointing out native plants, animals, and birds as you walk along. Pass two waterfalls along the way and arrive at a look-out platform with incredible views! Sky Walk tour includes: Hanging bridges entrance fee, bilingual guide. Sky Tram & Walk tour includes: Tram ride, hanging bridges entrance fee, bilingual guide. Sky Tram & Sky Trek tour includes: Tram ride, zip lining, all equipment and safety procedures, bilingual guide. Full Combo tour (Sky Tram, Sky Walk, and Sky Trek) includes: Tram ride, zip lining, hanging bridges entrance fee, all equipment and safety procedures, bilingual guide. Age limitation: Sky Tram and Sky Walk tours are suitable for all ages and abilities, Sky Trek tour (zip-lining) is limited to those over 4 ft tall and recommended for ages 8+. What to bring: Light clothing, rain jacket, comfortable shoes, camera, sunscreen, repellent. Features: The Sky Trek tour includes eight cross-sectional cables that together have a total length of 1.7 miles with distances from 100 to 2460 feet. The tour can be customized for groups.